MONTREAL -- Important decisions about NAFTA's future are now in the hands of the Trump administration, as American negotiators turn to their political masters for guidance with a potentially pivotal round of talks set to conclude on Monday. The Americans "engage, they listen ... They take (these ideas) and they say, 'We have to look at them in further detail and seek political guidance,"' according to one official with close knowledge of the talks. "It was not ... 'Thank you for your proposal, I'm leaving.' Let's just say we spoke about the (auto) issue twice, for about an hour and a half each time. So this is the type of engagement we're having, which I think is positive. It hadn't happened before." Earlier rounds had seen scant engagement on the most serious files -- with the U.S. dropping proposals that shocked the other countries, and the other countries insulting the American ideas and devoting one round to describing reasons their proposal on cars was so impractical. This round was an early example of countries seeking a pathway to solutions for more difficult problems -- and the talks didn't collapse. --On autos, the Canadians suggested new ways to calculate whether a car counts as American. The new formulas being proposed would inflate U.S. numbers somewhat by including areas where the U.S. dominates, such as intellectual property and research. --On dispute resolution, the Canadians and Mexicans threatened to sideline the Americans from the investor-state dispute system. The U.S. has suggested it might want to opt out, arguing it provides assurance for investors outsourcing operations to Mexico. 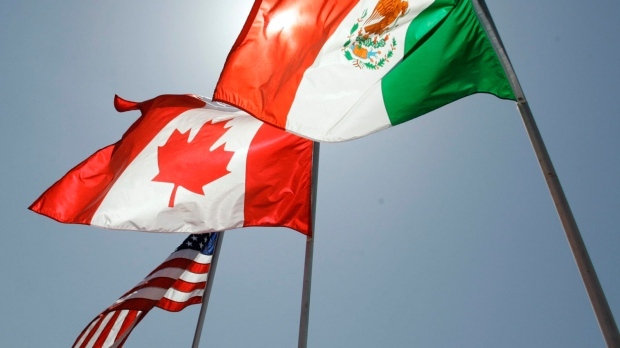 A Canadian counter-proposal, developed with Mexico, would prevent the U.S. from participating in or developing rules for the new system: "We basically said to them, 'If you want to opt out, that's fine -- you're gone,"' said one non-American. "You can imagine that the U.S. negotiators didn't like it." --On the review clause, the U.S. has proposed a rule that would terminate NAFTA every five years unless it's maintained by all three countries. Mexico responded a few months ago by proposing a watered-down version, which would force countries to periodically review the effects of the agreement -- but drop the automatic-termination rule. "It is the responsibility of the Canadian government and the U.S. government to incorporate in the new NAFTA agreement -- NAFTA 2.0 -- labour standards provisions, environmental provisions," he said.